Access 50,000+ videos, tests, quizzes, games, interactive lessons and much more. Videos that help you visualize each concept, making it easier to understand. Clearer concepts lead to higher scores! Every student has a Knowledge Graph based on their learning need & speed. This links different concepts and helps students identify their strengths & areas for improvement. Learning journeys are mapped to a student's grade & syllabus (CBSE, ICSE, IB, State boards etc). Each chapter comprises small concepts that are stitched together with adaptive questions as per the relevant syllabus. Adaptive, interactive tests that help students master each chapter. Recommended videos prompt students to correct mistakes in a practice session, enabling long lasting learning. 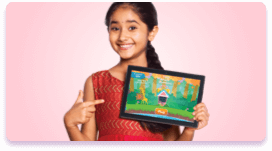 BYJU'S is the best App for my daughter to strengthen her Science basics. BYJU'S videos has helped me understand Math better and be confident. Every child learns differently. The all new personalized BYJU'S - The Learning App adapts to every student's learning need. To know more, schedule a free hour long counselling session at your home. BYJU’S is the world’s most valued Ed-Tech company and the creator of the most loved school-learning app in India. Launched in 2015, BYJU’S offers highly personalised, engaging and effective learning programs for students in classes 4-12(K-12), and aspirants of competitive exams like JEE, CAT, GMAT, IAS and GRE. With 33 million registered students and 2.2 million annual paid subscriptions, BYJU’S has become one of the most preferred education technology platforms across the globe. Our niche is creating personalised learning experiences for every type of learner. The BYJU’S way of learning provides students a learning platform where they can learn, engage and be excited about charting their own path to discover the world. BYJU’S - The Learning App brings together the best teachers, technology, content, media for creating a seamless, world class learning experience for each and every student. Learning is pivotal for a student’s success in academics and life. The Digital Age is deeply shaping the way students learn and will also determine their future prospects. At BYJU’S, we encourage students to embrace this fast, changing world and making them ready for tomorrow by being their constant learning partner. We craft learning journeys for every student that address their unique needs. We believe in the power of one-to-one learning that addresses every child's learning needs, allows students to be holistically involved in their education and be active, lifelong learners. Personalised Learning- is the foundation of our unique programs for students. Using knowledge graphs, the program adapts and creates personalised learning journeys for students. It provides a comprehensive coverage of over 1 lakh concepts with animated videos and questions, fun quizzes and flashcards. Based on the student’s progress, personal learning profiles are created which help analyse strengths and areas of improvement. Each concept gets tagged at different levels of difficulty to create a smooth learning curve which keeps students motivated through any new learning challenge. Whenever errors are made, motivating remedial methods are generated to strengthen and improve the student’s learning experience. At BYJU’S, we leverage technology to merge best practices like use of videos, engaging content and quizzes with the best teachers so that every child across the globe has access to the best learning experiences. The BYJU’S Learning Programs provide students a holistic learning experience. Students across regions can access the best teachers and see concepts come to life. Every detail of a student’s journey is planned and executed at the deepest level with subject matter experts, teachers and tools like videos, interactive animations, quizzes and assessments. The app integrates these well crafted lessons from our teachers and assessments along with analysis and recommendations, personalised to suit each student’s learning style. This holistic approach has seen a student engagement of over 64 minutes a day, being spent by a student on the app,making it one of the most loved apps for students across age groups. © 2019, BYJU'S. All rights reserved.